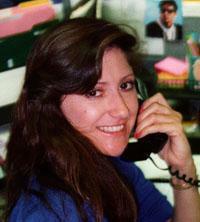 Jeanine Harms disappeared July 27, 2001. A hearing to suppress evidence in the case of Maurice Nasmeh, the 41-year-old architect accused of killing Jeanine Harms of Los Gatos, has been postponed until Dec. 23. Santa Clara County Superior Court Judge Randolf Rice, who had been expected to hear the case today, was absent from the court for unexplained reasons. Judge Edward Lee, standing in for him, set the new date. The motion to suppress evidence was brought by Nasmeh's attorney, Daniel Jensen of San Jose. Jensen was seeking to set aside evidence because, he contends, police officers went beyond the scope of their search warrant in looking for evidence in Nasmeh's sport-utility vehicle by seizing the car. The search warrant was issued within days of the July 27, 2001, disappearance of Harms. Nasmeh was the last person known to have seen Harms alive on that night after a date with him. Evidence from Nasmeh's vehicle yielded fibers that led to his arrest in December 2004. The fibers, authorities believe, are from a rug project of Harms that were found in the cargo area of the car and on a carpet that allegedly was used in disposing her body. Harms' body has never been found. Nasmeh has pleaded not guilty.